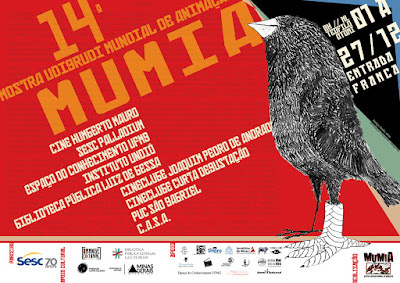 Following up on my previous announcement that Klementhro would be back in Brazil this December for the 14th MUMIA Underground World Animation Festival, the festival programme has been published so I can now confirm when and where the screenings will actually take place. At 4pm on Sunday December 4th festival patrons - Mumians, I've decided should be the collective term - can catch the film as part of the International Competition 8 screening at the Cine Humberto Mauro. Then at 5pm on Wednesday December 7th there will be a repeat screening at the Cine Sesc Palladium. So there ya go. Oh, it's in Belo Horizonte, by the way. Incidentally MUMIA was one of the last festivals to screen The Naughty List, so it's fitting that it would be among the last to screen this one too. OR WILL IT?